There’s also a record of the ice-out date on Lake Winnipesaukee in New Hampshire. There the trend is -5.6 days/century since 1887, but the 30-year trend is -28 days/century. Most impressive is Severnaya Zemlya in Russia, the last archipelago in the world to be mapped, under Stalin. Stalin also seems to have borrowed Graf Zeppelin to fly over it for possible mapping.. But in quite recent years, it has been possible to sail all the way around both Severnaya Zemlya and Franz Josefs land during the season.. However, there seems to have come more frost again in the Northwestern passage, where a private katamaran with sails and outboard motor plus even a large passenger cruise ship with paying passengers passed through for the first time, some years ago. According to sea ice maps, Roald Amundsen would not have come all the way to Gjøa Haven by the first season, in 2018. And he froze tight at Cape Chelyuskin With his new ship Maud in 1918. Where Nordenskjølds polar ship Vega and Fr.Nansens Fram had easily passed through in the season decades earlier. When do we get to call it a downward hockeystick? What’s nice about tracking ice-out dates is that the data doesn’t suffer from UHI effects, instrument changes, calibration issues, etc. that will impact thermometer readings. Catastrophic climate change is on its way. This smashed the previous record earliest melt, which lasted for 79 years, by over 6 days! Hey, dudes, it’s just one year of ice melt, don’t get all sky-rockety, but hang on to your hats! I am hoping to hear Nigel put this in context for us all. Well before registering for any adverse health insurance plan, you need to evaluate at the very least 3 diverse estimates with different firms, to successfully are becoming the best price available. Don’t make an effort with lower price cards and indemnity plans, except if you definitely, cannot get yourself a full health insurance strategy and people will be the only possibilities. With regards to picking a tooth paste, there are virtually lots of choices you may have at the store. Regardless of what form of toothpaste you end up picking, the biggest thing is that it include fluoride. Fluoride is really a chemical in keeping your tooth clean and healthier so be sure you utilize it. If you advertise property by way of the world wide web, it is essential that you remain along with the most up-to-date tools and techniques from the online. If you do not understand the possibly-changing construction of the internet, your web site will fall behind and you will lose thousands of buyers over time. @mike #8. It’s 90 years of ice-out data–not one. That is all. The most reliable signal from rising trends in temperatures come from ground temperature profiles in permafrost boteholes. Since the permafrost (if continous) prohibits water circulation in the ground, there are no other influences on ground temperature than temperature at the ground surface. This of course can be changing because of other variables than the air temperature, mainly thickness and duration of snow cover, caracteristics of the vegetation and moisture content of the active layer (the uppermost part of the ground, which thaws every summer and is therefore not part of the permafrost – mainly ranging from av few decimeters in cold arctic regions up to several meters above “warm” alpine permafrost fx here in Southern Norway). Since the ground is a slow conductor of heat, the shape of the mean temperature curve down in the ground will give a very good indication of the trend in air temperatures at the location of the botehole bakcwards in time, provided there are no big changes in snow conditions. Fx in Svalbard a borehole at Janssonhaugen near Longyearbyen gives a very clear signal from the exceptionally fast rising air temperatures in Svalbard in the last several decades. Normally you would expect the depth of zero annual amplitude (zaa) to be around twenty meters, but now in the latest decades zaa is at around sixty meters depth. 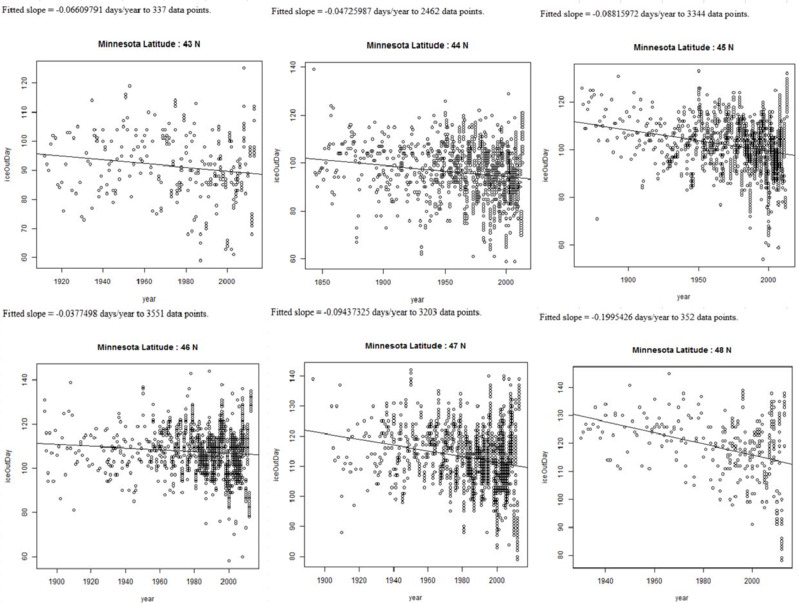 Almost exactly the same extreme warming trend is seen in akaskan boreholes and boreholes in the Alps, in scandinavian mountain regions etc. Sorry for my writing errors: boreholes (not boteholes) and characteristics (not caracteristics). to dan at 10: I have reconsidered. The ice-out stat for this year looks bad. It could be an outlier, but I don’t think it is. 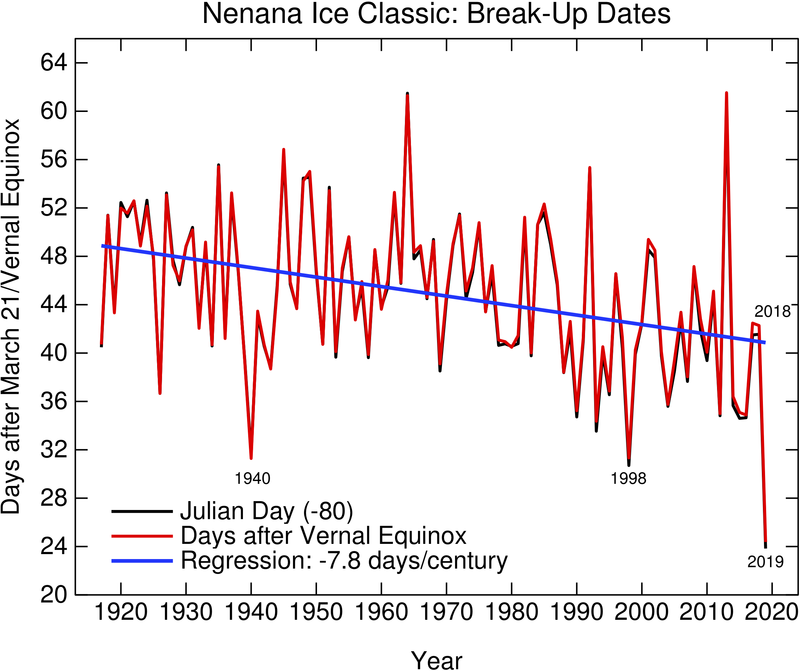 The outlier argument is likely to be made by many about this year’s early ice out date. We haven’t hit Wadhams territory yet, but I honestly don’t think this ice out data point is an outlier. The warming of the Arctic could turn out to be a big problem with numerous feedback consequences. I tire of typing in these concerns because I can be assured that numerous folks who post here regularly will try to act like the adults in the room and minimize the concerns. It’s too bad that our species is not willing to do very much about the underlying problem of CO2 emissions and CO2 accumulation in atmosphere and oceans. Per #9: I know the moderators have better things to do with their time, but I question the utility of slowing discussion by delay for moderation when a spam post about toothpaste etc. apparently passes muster and makes it through the moderation process.